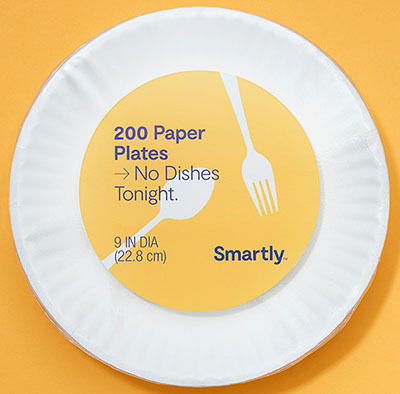 Target Corp. is upping the ante in private label with Smartly, a new value-focused, nonfood brand due to launch this weekend. Target said Monday that Smartly focuses on daily household essentials and includes more than 70 items, such as hand soap, paper plates, household cleaners and razors. Prices range from 59 cents to $11.99, but the Minneapolis-based retailer noted that most items carry prices less than $2. Products will be sold individually or in small multipacks, perfect for guests living in small spaces and offering a lower-priced brand that doesn't require purchasing in bulk. Plans call for the new brand to roll out to stores and online Oct. 14, and it will be available year-round. 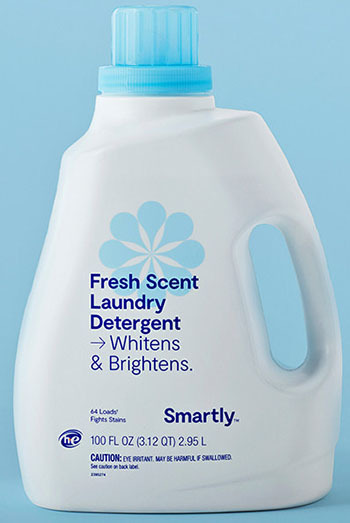 Other products in the Smartly line include paper towels, plastic utensils, plastic and paper sandwich/lunch bags, plastic straws, liquid and power laundry detergent, napkins, paper towels, bathroom tissue, liquid dish detergent, shaving cream, and hand and body lotion. Along with an everyday value focus, Target aims to differentiate Smartly in design and product attributes. The retailer said the brand’s packaging takes a modern and fun approach, with simple, colorful labels bearing expressions such as "smells like well, nothing" on a bar of unscented soap, “whitens and brightens” on laundry detergent, “brown bag it” on lunch bags and "no dishes tonight" on disposable plates. In addition, the company said it worked with master perfumers to develop a range of fragrances for Smartly products. Liquid hand soap, for example, comes in such scents as Rain Shower and Lavender, while all-purpose cleaners include fragrances like Ocean and Citrus Grove. According to Tritton, Smartly brings a lower-priced alternative to Target's selection of household essentials. "Smartly offers incredible value, looks great and, most importantly, gets the job done,” he stated. “It broadens our assortment to give guests even more options to find the product that's right for them, regardless of their budget." Target CEO Brian Cornell had said early this year that the discount chain would continue to expand its private label and exclusive-brand portfolio in 2018, building on the 10 brands it introduced in 2017. In food and nonfood grocery, health and beauty aids, and baby care, the retailer’s brands include Market Pantry, Archer Farms, Simply Balanced, Sutton & Dodge and Up & Up, as well as the Boots & Barkley pet care brand. Private label has become a more intense competitive battleground among food, drug and mass retailers as they look to boost margins and drive traffic by offering an array of high-quality brands found only in their stores. The Kroger Co., Albertsons Cos., Walmart, Aldi U.S., Ahold Delhaize USA and Wakefern Food Corp., among other grocery retailers, have steadily ramped up their own-brand programs in recent years. A newer entrant to the private label fray is Amazon, noted e-commerce analytics firm One Click Retail. The e-tail giant’s Basic Care over-the-counter medicine and health care brand, launched in August 2017, has already garnered 15% of OTC sales on Amazon.com, while the Good Sense HBA brand from Perrigo — which manufactures the Basic Care line for Amazon — has dropped from more than 20% to 9% share, One Click reported. Amazon also has seen booming sales with Mama Bear diapers, and the retailer has partnered with First Quality to introduce an exclusive diaper line called Earth+Eden. Other Amazon private brands include AmazonBasics (batteries), Amazon Elements (health and baby care, vitamins and supplements), and Happy Belly and Wickedly Prime (food and snacks).